For a small island off the east coast of Puerto Rico with little infrastructure, less luxury, and even less nightlife, there are only so many reasons people visit Culebra: to get away, to get "off island," and to get to the beach. 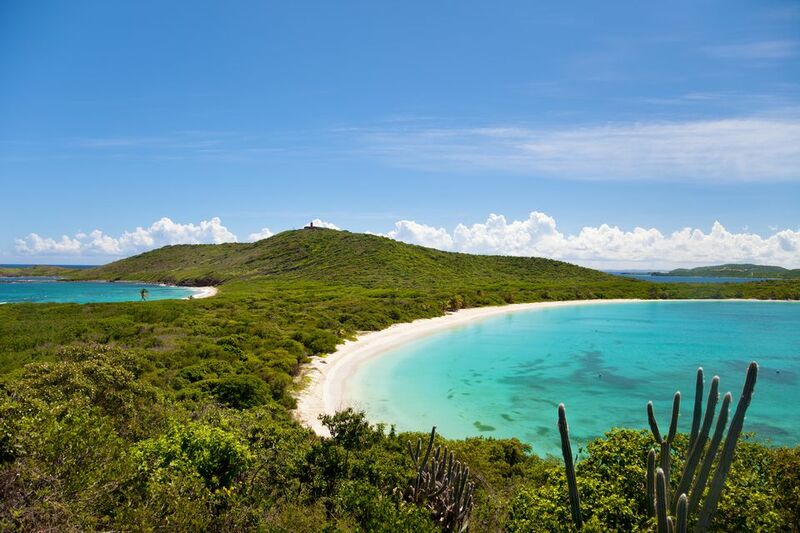 And for a small island, Culebra has plenty of beaches, from a world-class paradise to spots that will make you sweat, bleed, and scratch just to get there. Take a closer look. The eastern side of the island tends to attract the long-term crowd; those who have bought or rented homes in the area, and who enjoy the relative isolation that Zoni provides. A long and narrow strip of sand, Zoni is a sandy beach facing Culebrita and Cayo Norte. The grandaddy of beaches, not only in Culebra but, some would say, all of Puerto Rico, Flamenco Beach is the island's Eden, its sacred beauty, and its most popular destination. It's a good bet that most of the people who come to Culebra come here because they have heard of, or want to get back to, Flamenco Beach. People spend months camping just a few feet away from the water in designated campgrounds. And with its iconic tanks, a designated area with kiosks selling food, ​drinks and beach accessories, and plenty of public transportation options to and from the beach, Flamenco won't lose its place atop Culebra's most beloved destinations anytime soon. A trail from the parking lot at Flamenco Beach leads you on a 15-20 minute hike to the vastly underrated Carlos Rosario Beach. A pristine stretch of beach facing Cayo Luis Peña, Carlos Rosario is considered Culebra's best spot for snorkeling, but it also offers a wonderful place to sunbathe, dip in azure waters, and take a break from the Flamenco crowds. Tamarindo Beach can be rocky at times, smooth at others. It's far less visited than its neighbors, Flamenco and Carlos Rosario, and therefore offers a bit more privacy, if that's what you're looking for. It also offers decent snorkeling. As long as you're beach-hopping, stop by and check it out; you might just want to stay a while. The southernmost of Culebra's beaches, Dakity and Soldier's Point are very rocky, and probably best reached by kayak. The trail down to Dakity gets bumpy in places and will challenge your driving skills a bit. Even if you're not a huge fan of making the trek to the beach, you'll love the sunsets from these spots. Among the closest beaches to the town of Dewey, Melones is an attractive spot that's a bit pebbly for those who want to lie on the sand all day but great for those who want to swim, snorkel, and watch the sunset. By the time you get to Brava Beach, you'll certainly feel accomplished. Getting to this beach requires a long hike down without markers to guide you. Once you get there, you might just find that you're the only person on this crescent of sand. The surf here is pretty rough, making swimming too far out inadvisable, but if you want an adventure and crave a place to call your own, try Brava. If you think the trek to Brava is tough, forget about getting to Resaca. It's the most difficult beach to get to in Culebra, and unless you relish a challenging hike, you're better off getting here by boat. It's also a mirror image of next-door Brava Beach. Resaca, incidentally, means "undertow," so we wouldn't recommend swimming. You'll need a water taxi to get to the last three beaches on this list, starting with West Beach. A narrow strip of beautiful beach on the western shore of the island of Culebrita, West Beach has amazing multi-colored waters and marine life. But as nice as it is, don't spend all day here; not when there are two other beautiful beaches to see on this small island getaway. One of the least appropriate names you'll find, Trash Beach was so-called because of the trash that used to wash up on its shores. Should you choose to explore this beach, you'll likely find a wide crescent of sand facing the booming surf of the waves. It is generally pretty isolated. If you want a special place to lie on the beach and disconnect, this spot will do nicely, but make sure not to go swimming here. The surf is very strong. There's something special about Playa Tortuga, a horseshoe-shaped beach facing calm waters, thanks to its encircling arms that protect against the rough surf. Playa Tortuga offers a scenic backdrop that includes, in the distance, Culebra's only manmade landmark, a small lighthouse long abandoned. On its western end, you'll come to shallow pools and a small promontory that offers beautiful views, photo ops and, in the distance, a glimpse of St. Thomas.